The Tempus Moxi Fit R (rechargeable) hearing aid harnesses the same great technology of all Unitron hearing aids built on the Tempus platform, but in a rechargeable form factor. With just a single overnight charge, the Moxi Fit R will provide better hearing for 24 hours. These hearing aids come with a discreet charger included, to allow for easy docking and charging of the hearing aids at any time. Not sure rechargeable hearing aids are for you? You can always revert back to using traditional batteries at any time. 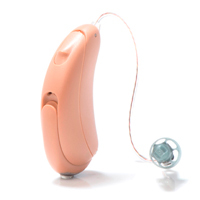 The Tempus Moxi Fit R is an award-winning RIC-style hearing aid with a size-312 battery, push button control, and a telecoil. Compared to its predecessor, Tempus Moxi Fit is 50% more accurate and 36?ster at locating speech. You will get the most from this update at the T700 level and above, which include a wider range of automatic features. Examples include: Spatial Awareness processing to make it easier to recognize the location of sounds around you, up to seven classes of listening environments, and SpeechPro speech enhancements for a more natural sound quality. Other features found across the performance levels include wind noise reduction, adaptive direction microphones, and feedback cancellation. You want the convenience of a rechargeable hearing aid with the safety of always being able to switch to a disposable battery.